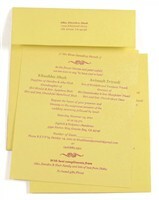 D-754, Red Color, Hindu Cards. 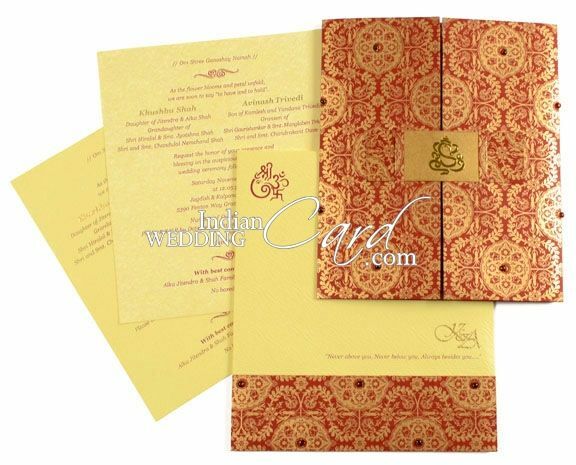 The front of this wedding card has a very royal and intricately designed base design in gold with kundan work highlighting. The latch strip has the embossed Ganesh ji image in gold leaf work. The holding strip for the inserts too has a similar base with kundan work. 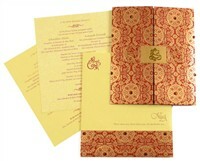 The inserts are plain and the envelope too has the paste up strip with a similar base to the front having kundan work.